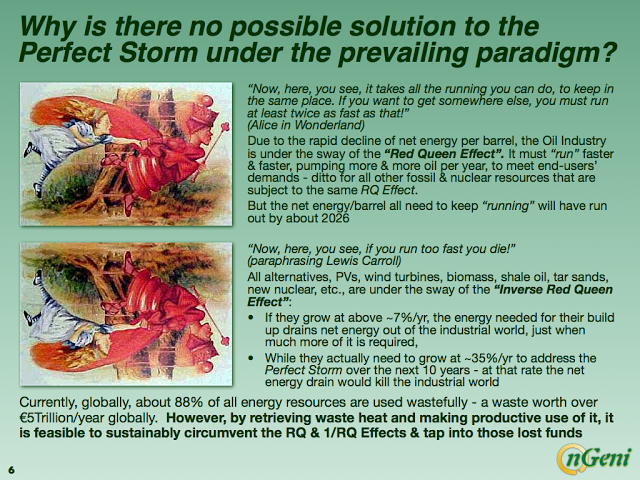 This three-part post was inspired by Ugo Bardi’s recent post concerning “Will Renewables Ever ReplaceFossils?” and recent discussions within Ugo’s discussion group on how is it that “Economists still don’t get it”? It integrates also numerous discussion and exchanges I have had with colleagues and business partners over the last three years. Since at least the end of 2014 there has been increasing confusions about oil prices, whether so-called “Peal Oil” has already happened, or will happen in the future and when, matters of EROI (or EROEI) values for current energy sources and for alternatives, climate change and the phantasmatic 2oC warming limit, and concerning the feasibility of shifting rapidly to renewables or sustainable sources of energy supply. Overall, it matters a great deal whether a reasonable time horizon to act is say 50 years, i.e. in the main the troubles that we are contemplating are taking place way past 2050, or if we are already in deep trouble and the timeframe to try and extricate ourselves is some 10 years. Answering this kind of question requires paying close attention to system boundary definitions and scrutinising all matters taken for granted. If we had a whole century ahead of us to transition, it would be comparatively easy. Unfortunately, we no longer have that leisure since the second key challenge is the remaining timeframe for whole system replacement. 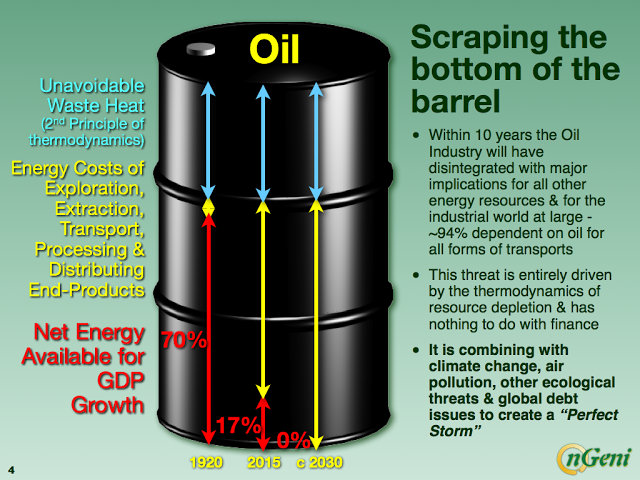 What most people miss is that the rapid end of the Oil Age began in 2012 and will be over within some 10 years. To the best of my knowledge, the most advanced material in this matter is the thermodynamic analysis of the oil industry taken as a whole system (OI) produced by The Hill’s Group (THG) over the last two years or so (http://www.thehillsgroup.org). THG are seasoned US oil industry engineers led by B.W. Hill. I find its analysis elegant and rock hard. For example, one of its outputs concerns oil prices. Over a 56 year time period, its correlation factor with historical data is 0.995. In consequence, they began to warn in 2013 about the oil price crash that began late 2014 (see:http://www.thehillsgroup.org/depletion2_022.htm). In what follows I rely on THG’s report and my own work. 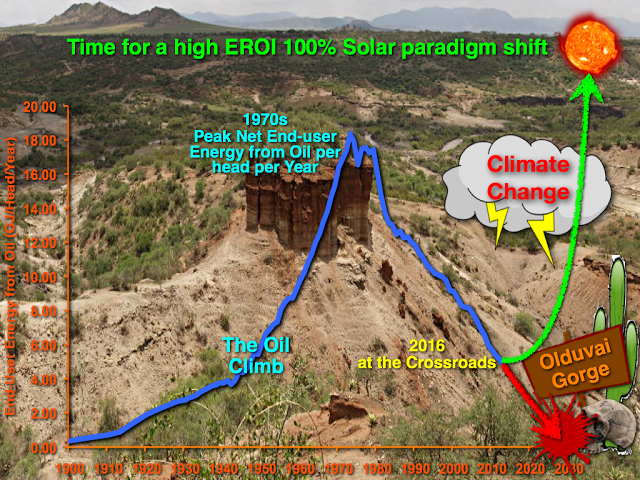 The Oil Age is finishing now, not in a slow, smooth, long slide down from “Peak Oil”, but in a rapid fizzling out of net energy. This is now combining with things like climate change and the global debt issues to generate what I call a“Perfect Storm” big enough to bring the GIW to its knees. At present, under the prevailing paradigm, there is no known way to exit from the Perfect Storm within the emerging time constraint (available time has shrunk by one order of magnitude, from 100 to 10 years). This is where I think thatDoomstead Diner’s readers are guessing right. Many readers are no doubt familiar with the so-called “Red Queen”effect illustrated in Figure 2 – to have to run fast to stay put, and even faster to be able to move forward. The OI is fully caught in it. In other words, current growth rates for solar and wind, well above 20% and in some cases over 60%, are not viable globally. However, the kind of growth rates, in the order of 35%, that are required for a very short transition under thePerfect Storm time frame are even less viable – if “we” stick to the prevailing paradigm, that is. As the last part ofFigure 2 suggests, there is a way out by focusing on current huge energy waste, but presently this is the road not taken. This is what is now actually driving the oil prices: since 2014, through millions of trade transactions (functioning as the“invisible hand” of the markets), the reality is progressively filtering that the GIW can only afford oil prices in proportion to the amount of GDP growth that can be generated by a rapidly shrinking net energy delivered per barrel, which is no longer much. Soon it will be nil. So oil prices are actually on a downtrend towards nil. Informative first part. Such detailed analysis us essential for understanding the relation of oil prices and il production. Even if this writer could manage with plain English and avoid stupid contractions (BAU – really!) I am not sure he has the desire to communicate. There is certainly a lot of confusion around, particularly about the motives of those promoting climate change. 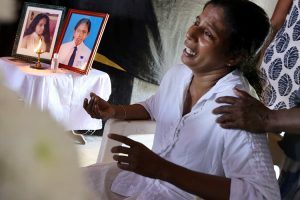 While changes in climate have never stopped happening, the current degree of changes and causes are not universally agreed among the scientific community despite the politically inspired lies. That is not to say that said lies may not serve an important purpose. The voting public hardly understands either climate science or the forces controlling visible politicians, but propaganda will distract people while problems of global friction are solved behind the scenes by people with the power to do so.